With the winter season underway, your cat’s coat may have changed to reflect the need to warm up. What other ways do cats adapt to the cold? In some cases, if you have an indoor cat, you may not notice too much of a difference. However, temperature changes can be more concerning for senior cats and small kittens, as well as hairless and outdoor cats. If you notice changes in your cat’s breathing, including respiratory problems, then your cat may need extra care during frigid months. So how can you tell if your cat is okay in the cold? This guide breaks down every way that cats communicate their temperature preferences, so you can help your cat stay warm and happy during cold weather. One of the main concerns for cat moms and dads is how to tell if a cat is uncomfortable or even sick because of cold weather. You may think that you can see your cat shaking or seeking out warmth, but there are actually many factors that can alert you to the way your cat feels during the cold. According to TheNest, Thinner cats will have a much harder time dealing with the cold. In this case, make sure that cats have water and food at all times, and add some fat to their diet if possible, such as canned food with higher amounts of protein and fat. According to the College of Veterinary Medicine & Biomedical Sciences, Texas A&M University, Does your cat have a thicker coat than usual? In the winter, some cats developed thicker, longer coats in order to block out frigid temperatures and stay warm. Short hair and long-hair cats will typically show this start in late fall until spring. According to Argos Pet Insurance, Cats are susceptible to the same cold symptoms and respiratory problems in the winter months. Typical symptoms of a cat cold include sneezing, runny nose, watery eyes, shallow breaths, and wheezing. If you notice your cat struggling with respiratory problems, you should make sure to keep them warm, give them water, and be vigilant to see if signs worse. If so, head to your vet to get some antibiotics and possibly a steroid. Start by feeling your cat’s paws. Do they feel chilled? The average body temperature for cats is slightly higher than humans at 103.5 degrees Fahrenheit. If you notice your cat has dropped to temperatures lower than 99 degrees Fahrenheit, they could be suffering from mild hypothermia. According to PetMD, However, temperatures lower than 90 degrees Fahrenheit are dangerous and could lead to severe hypothermia, resulting in death. If you notice your cat sitting on their paws, such as in the “meatloaf” position, then they are trying to conserve energy and keep warm. They may also seek out a sunny spot or a warm rug when they assume this position. When cats are extremely cold, they will shiver uncontrollably and they may not want to drink or eat as normal. Does your cat keep meowing while shaking or scratching at the door from outside? It’s likely that your cat wants you to turn on the heat or let them inside to soak up the warmth. Did you know that cats with thyroid issues are more prone to respiratory infections and other types of sicknesses? You can protect these cats with a warm pet bed or heated blanket on low setting. You should pay attention to how your cat is behaving and be prepared to warm up your cat with blankets. Special formulas of milk for cats can be warmed in small amounts to help kittens who are underbody mass and not coping well with the cold. Older cats and young kittens are more susceptible to cold as well. It’s best to make sure they have a warm shelter or blankets to keep them warm, especially if their pads are ice cold. Do Cats Like Cold Weather? Every cat is different. Some are intrigued by snow, others prefer the warmth of the indoors. Still, what cat wants to freeze to death? Cats always seek comfort, and they are pretty well-adapted to cold weather due to their coats. However, cats typically seek out shelter during frigid temperatures. If you have a cat that likes to stay outside, then you should build a warm shelter for your feline to retreat to. It should be large enough so your cat can turn around. The structure will hold more warmth if elevated off the ground in a covered place, while also including blankets and possibly a wood barrier to prevent warmth from escaping. The best way to keep your cat warm and happy is bringing them inside. They will naturally seek out the warmest and most comfortable spot in the house, but you can always make it easier with a wool blanket or other type of bed for them to cozy up in. If your cat has a lower body temperature, then the best thing to do is ensure that they are warm and dry, then wrap them like a burrito in a heated blanket on low setting, monitoring their body temperature until they are above 98 degrees Fahrenheit. In general, when temperatures fall below 70 degrees, your cat will likely have to look for warm shelter at night. With wind and snow, temperatures could decrease even further. In these cases, it’s best to bring your pets inside. Usually, cats will show signs of discomfort, such as meowing and scratching at the door to be let in. However, you can also check your cat’s paw pads and use a thermometer if possible to see what their body temperature is. If you notice that your cat has a temperature lower than 98 degrees Fahrenheit, they could be heading into mild hypothermia territory. If you do have an outdoor cat, you can always install a cat door to a garage or mudroom, where they can find warmth and shelter from the elements. For indoor cats, you may notice that they want to head to a warmer part of the home, burrowing under blankets and seeking out cushions to hide under. They may even try to climb in your lap or hang out in the bathroom, where it can be a little bit more insulated. Do Cats Get Cold at Night? When the sun goes down, temperatures will drop further, decreasing as the night goes on. It’s coldest in the early morning just before sunrise. During winter months, leaving your cat outside overnight can be dangerous to their health. Even if they are able to withstand low temperatures, they may develop cold and respiratory problems that will cause other complications, including death. Cats will get colder at night inside as well, especially if you do not have a strong heater or keep your heater off. It’s best if you keep your home above 70 degrees Fahrenheit to avoid any issues, but if you don’t want to run the heat, you should make sure to have a warm bed and shelter available for your cat as well. When a cat is cold, you’ll notice that they try to seek out the warmest spot in the house anyway, such as rugs in well-insulated areas and spaces near heat vents or fireplaces. What Temperature is Too Cold for Indoor Cats? Cats are able to adjust and adapt to lower temperatures to a certain degree. However, a temperature between 86 and 97 degrees is what most cat breeds would prefer, but this isn’t really suitable for humans, who have lower but much more particular preferences, as you may know. Some breeds don’t need such a high temperature. You can just look at the Norwegian Forest cat in their snow caves to see how they are more suited to the cold than a short-haired breed. 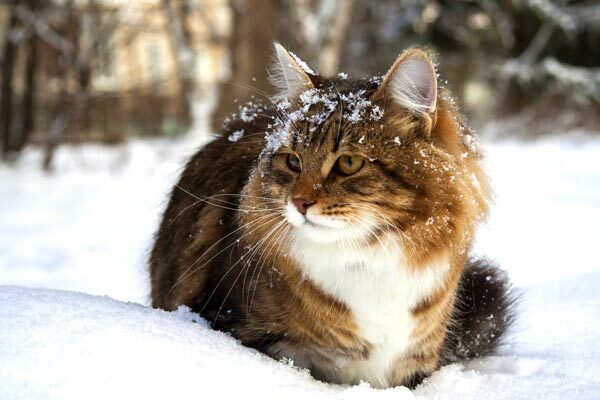 If your cat is a healthy, long-haired breed with a high body fat mass, you probably won’t have to worry about them ever getting cold. They can safely insulate themselves indoors if they find themselves feeling chilly. In this case, temperatures as low as 60 degrees inside won’t typically cause any harm. However, if you notice any of the cat behaviors in the first section, then you should turn up the heat. Closer to low 70s is a good range to keep you and your cat happy. If you do have a skinny or older cat with a short coat, you may want to keep the temperature a bit warmer and provide a nice bed where they can curl up to escape the cold. According to Vetted Pet Care, Without knowing your cat’s coat, weight, or health, it’s hard to say what temperature is too cold. However, vets advise that temperatures lower than 45 degrees Fahrenheit outside can be dangerous for an outdoor cat. However, that’s an average, and it may not be good for your cat, especially if they don’t experience the cold that often. In addition, temperatures can fall even lower at night. If your cat gets too cold, then your cat’s body temperature will fall, slowing the heart rate and chilling the nervous system. Cats can get frostbite and hypothermia, which could result in death if they are left out in the cold too long. Your cat may not be able to tell you when they are uncomfortable, but if you are a vigilant feline parent, you will notice that they act differently once the temperature drops. If your furry friend isn’t able to find a warm spot for shelter from lower temperatures, you may hear them meow and scratch in search of warmth. While the ideal room temperature varies based on your cat’s breed, health, size, and age, you should keep your house’s room temperature to an average between 70 and 75 degrees Fahrenheit at least during the winter. While short-haired and hairless cats prefer warmer temperatures, it’s a happy medium, and if they seek out the warmth in your bed or lap, you should make sure that their paw pads are warm and silky smooth. Long-haired cats can’t tolerate as higher temperatures but won’t necessarily complain. Instead, if you keep your home warmer in winter months, they’ll seek out cold flat surfaces for relief from the heat. While cats can sneeze and snort because of dust and allergens, they can also develop respiratory illnesses from fending off colder temperatures every day. Respiratory infections, such as an upper respiratory infection (URI), can irritate your cat’s throat and cause other problems if not treated. According to PetMD, Colds are typically caused by an infection where more bacteria can develop, leading to feline pneumonia. Discharge from the nose and eyes, that tends to be thick and may have clear, yellow, white, or green colors. If you notice these symptoms, then you should follow a care routine to start and see if your cat is able to recover on their own. However, we recommend bringing your pet immediately to the doctor if they refuse food and water. Keep your cat’s eyes and nose free of discharge, using a soft cloth or moistened paper towel. Lukewarm canned food or even protein-rich baby food can entice your cat to eat if they are not feeling well. Make sure that they have fresh water. If your cat refuses water, hold out an ice cold for them to lick until you can bring them to the vet. Avoid any medications or pain relievers unless provided by a vet. Human medications are poisonous to cats even in small amounts. If the cat seems too cold, provide a heated blanket on a low setting to immediately warm them up and ensure that they have shelter from other pets. Keep other pets away from the water and food of a cat with URI as it can be infectious to other pets. Separate the litter boxes if you have another cat so as not to contaminate. In addition, make sure that your cat’s litter box is in a warm place and kept clean. 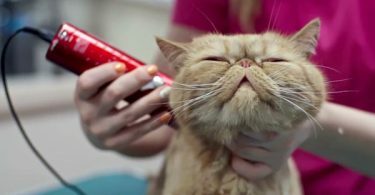 Cats suffering from a cold may also benefit from a vaporizer that creates warm moist air, or you can take a shower with your cat in a closed bathroom, allowing the steam to help your cat break up mucus in their breathing passageways. If your cat does have a respiratory problem, then you’ll want to keep them out of the cold at all times. A vet will typically be able to provide antibiotics and other medications to help break up mucus, but there could be more severe treatments, including draining of the lungs if the mucus is especially thought and causing breathing problems. 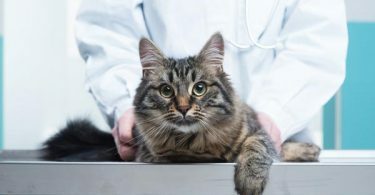 Most likely your vet will prescribe an antibiotic that will prevent the infection from spreading and fight it off by boosting your cat’s immune system. Vets recommend not allowing your cat to go outdoors due to the increase in feral cat diseases, such as hepatic lipidosis and feline herpes virus. Your cat is susceptible to more dangers than just the cold when they are left outside. 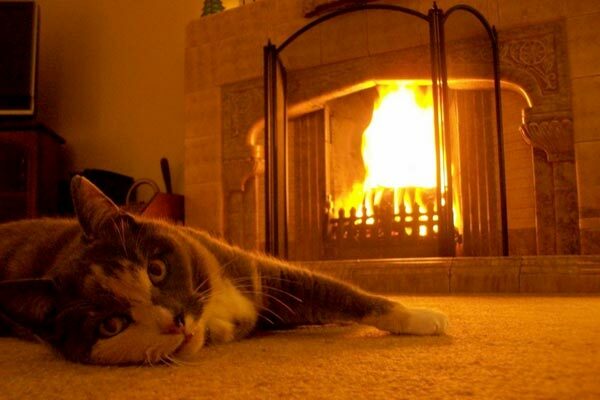 How Do Senior Cats Handle Cold Weather? Older cats are very particular when it comes to the cold. They won’t put up with frigid temperatures for too long and are easily more susceptible to respiratory infections from remaining in the cold. In addition, older cats may also have weaker bones and thinner coats, so it’s best that you set out some warm blankets or a heated bed where they can seek easy comfort. Keep your litter box in a warm spot to avoid problems with urinating outside of the litter box. Older cats won’t feel comfortable relieving themselves in a cold, damp place and will look for other “safe” places to go to the bathroom. Set the thermostat to a temperature over 70 degrees at least. If you have a thinner cat, then you may want to keep the thermostat to a higher temperature and put out warm blankets. Move their bed to a sunny spot in your home. Get a heated pet bed made for your cat’s size or try a heated blanket on low setting. It’s important to monitor these beds and blankets to ensure that they don’t get too hot or malfunction. Check your cat’s health and see if they are experiencing breathing problems. You should also keep senior cats indoors, where they are safer and better protected from the cold. Senior cats need a high protein diet, such as wet food with primarily meat ingredients. You should avoid food with a lot of additives. Canned food made from fish will also help to thicken a cat’s fur coat. You can talk to your vet about using fish oil as well, but these capsules may not be suitable for cats who have other health problem. Mama cats will naturally look for an isolated, safe space to keep their babies healthy. During the cold, you’ll need to take extra care of a pregnant cat and kittens to ensure that they don’t get stuck out in the old. Without their mother’s body heat, they can become susceptible to hypothermia and illness. You can create a warm playpen with proper bedding made from cotton blankets. A heating pad on low can also be helpful, but it shouldn’t be kept on for too long without monitoring. A great way to keep your mama cat and kittens in a protected environment is with a large box. First, line the bottom of the box with newspaper and cover with a small towel or cloth that won’t get bunched up. You can trim the box to have lower panels and an opening so your mother cat can leave as she pleases. In summary, there’s a lot you can do to prevent your cat from getting cold during winter months. If you have an outdoor cat, you should always pay attention to the weather report and temperature, making sure that you bring in your cat’s when temperatures drop lower than 60 degrees Fahrenheit, as overnight temperatures can decrease to below 45 degrees Fahrenheit. Cats should have a warm spot to seek shelter during the cold as well. For outdoor cats, this could be a dog house or other small enclosed structure that allows them to get away from the wind and frigid temperatures. Indoor cats may need a blanket or warm bed, but it’s most likely that they’ll seek out warmer areas on their own. If you have a cat that is experiencing hypothermia, you should get them into a warm, dry place as soon as possible, wrap them in a heated blanket, and treat them to some warm cat’s milk. When a cat’s temperature drops below 92 degrees Fahrenheit, they are experiencing more severe hypothermia and should be taken to a vet. While cats are easily able to adjust to cold temperatures, whether by developing a thicker coat or looking for warmth on their own, it’s your job as a cat parent to pay attention when they are uncomfortable and unable to find a cozy spot to stay warm.